The mean disease duration in patients with MS at baseline was 9.1 years. 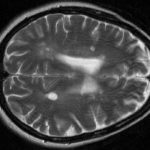 Serum neurofilament light chain (sNfL) may be an effective monitoring biomarker in patients with multiple sclerosis (MS) receiving personalized therapies, according to study results published in Multiple Sclerosis Journal. Researchers analyzed 144 samples obtained from 17 patients with active relapsing-remitting MS (RRMS) treated with alemtuzumab at the National Cancer Centre in Korea, and 35 samples from age- and gender- matched healthy volunteers. The researchers measured sNfL levels with single molecule array for a mean follow-up of 21 months. Serum samples were collected every 3 months and 1 month after alemtuzumab administration. Based on the sNfL findings, patients were categorized as having evidence of disease activity (EDA) or no evidence of disease activity (NEDA). The incidence of clinical relapse, defined as a newly developed neurologic deterioration of ≥24 hours without illness or fever, was measured. Patients with NEDA had no clinical relapse, no disability progression, and no radiologic activity. The levels of sNfL in patients with EDA were higher compared with patients with NEDA and healthy controls during alemtuzumab treatment (26.7±33.7 pg/mL vs 10.4±4.7pg/mL and 5.9±2.2 pg/mL, respectively; P <.001). In patients with NEDA, the levels of sNfL were low and relatively stable compared with the variability in patients with EDA. Patients with EDA had increased in their radiologically and/or clinically active status. The levels of sNFl in radiologically and/or clinically active status samples were higher than both radiologically and clinically inactive samples (P <.001). A limitation of this study was the inclusion of samples from a predominantly Asian cohort with a small number of patients. “Our results support that sNfL can be an additional therapeutic monitoring biomarker reflecting disease activity for individualized therapeutic approaches in patients with MS,” concluded the researchers. Su-Hyun Kim and Ho Jin Kim have declared affiliations with pharmaceutical companies. Please see the original reference for a full list of disclosures.